Whether it’s been coming out of retirement, returning from injury or defying the odds to win a race from seemingly impossible positions, there have been some great comebacks in motorcycle racing over the years. When it’s been in the former, it’s often been met with shakes of the head and comments like ‘it’s a bad idea’ and not all of them have ended well whilst riders will do anything to race again despite having been seriously injured in the sport they love. Here’s a look at some of the best comebacks we’ve seen. Arguably the greatest comeback of all time, the general consensus on Mike Hailwood making a return to the Isle of Man TT Races in 1978 after an 11-year lay-off was that he was mad – as great as he was, times had changed massively and the list of unknowns was endless including the fact he had never ridden on slick tyres and the bikes were now fitted with disc brakes and not drum brakes. Few believed he could be competitive after such a long absence. 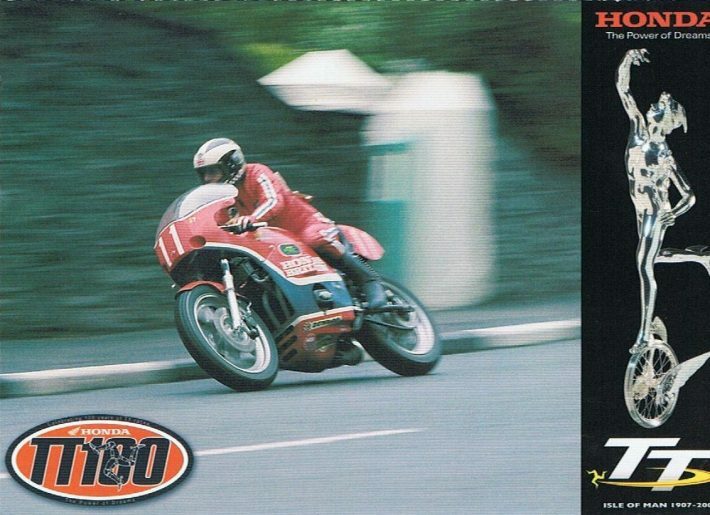 Having done a heavily-disguised lap at the 1977 Manx Grand Prix to try and familiarise himself with the Mountain Course, Hailwood returned in 1978 with a Ducati 900SS provided by Sports Motorcycles and 250cc, 500cc and 750cc Yamahas in Martini-livery. His first race, the Formula One, was on the 3rd June and not only was the then 38-year old competitive, he managed to take a hugely popular win to complete a fairy-tale comeback. The island was overloaded with visitors and grown men were seen crying such was the enormity of what they’d just witnessed. He returned in 1979 although the Ducati was now outgunned by its rivals and he could only manage fifth in the F1 race but, for his two other races that week, the Senior and Classic, he had a two-stroke RG500 Suzuki at his disposal and he romped to his 14th TT victory in the former, lapping at more than 114mph. He then used the same bike in the Classic and battled for the lead with Alex George for all 6 laps in yet another TT epic. Over a minute apart on the road, they were rarely a few seconds apart on time but Hailwood lost out by just 3.4 seconds. Although not to the same magnitude of Hailwood, Phil Read’s return to the Isle of Man TT races in 1977 after a five-year lay off was impressive nonetheless. Along with fellow World Champions Giacomo Agostini and Rod Gould, the Luton-born rider had led the boycotting of the event with the view that it was too dangerous and not fit to be included in the World Championship so his return was not without controversy. Read’s view was that he was always happy to race at the TT so had no issues with returning – he just didn’t feel it was right to be forced to race there for world championship points. The financial rewards had increased considerably with the Manx Government enticing Read, and others, with large sums of money, and he made his comeback with a variety of machinery. 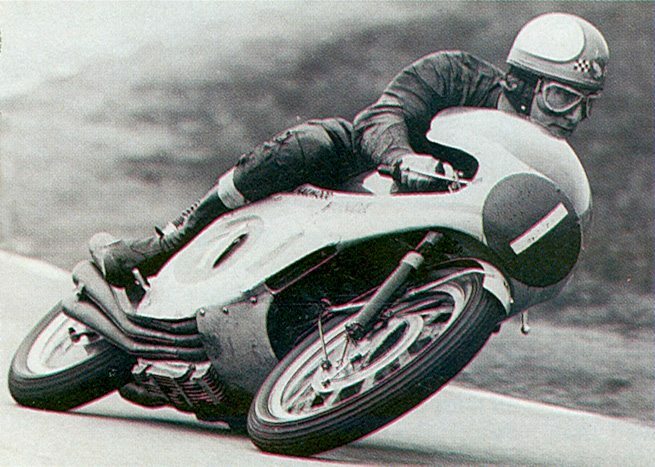 His first race was the newly introduced World Formula One race, where he was on board a works Honda CB750, and he duly took his sixth TT win and eighth world title although this too wasn’t without controversy as the race was stopped early due to heavy rain. Locked in battle with Roger Nicholls, Honda Britain got wind of the decision so waved Read through at the end of the third lap instead of pitting him for fuel but Nicholls pitted and so lost valuable time. Read then raced his own RG500 Suzuki in the Senior, taking another victory and lapping at more than 110mph, and was on course to take a hat-trick. However, he crashed at Brandish prior to the Classic race whilst unofficially testing his TZ750 Yamaha and subsequently broke his collarbone. He returned in 1978 and had a memorable battle with Hailwood in the F1 race before competing in his last TT in 1982, when he finished fourth in the Senior at the age of 43. Barry Sheene defied the odds not once but twice and performed two miraculous comebacks from injury suffered in two unbelievably high-speed crashes. The first one came at the Daytona 200 in March 1975 when aged just 25 but it was a crash that catapulted him up the popularity charts as the 175mph crash was all caught on camera as a television crew were there to produce a documentary. Caused by a rear tyre exploding, Sheene was left in a crumpled heap on the banking with a broken left thigh, right arm, collarbone and two ribs, yet he recovered and was racing again, miraculously seven weeks afterwards. And riding the RG500 Suzuki, he took his first 500cc World Championship win at the Dutch TT in June. Having won two world titles in 1976 and 1977, Sheene was back in contention for a third title in 1982 when he suffered another high-speed crash, this time at Silverstone when he hit the obscured fallen machine of Frenchman Patrick Igoa at 160mph during practice for the British Grand Prix. On this occasion, many thought it truly was the end and his legs were completely shattered. The surgeon who pieced him together in an eight-hour operation said it was the most intricate procedure he had ever performed, comparing the patient’s injuries to a “jigsaw puzzle”. Two 7in buttresses of stainless steel, two 5in plates and 26 steel screws were required to hold together the fragments of bone in his legs but he again returned to racing the following season. Although the spill ended his potential as a title threat, he raced for two more seasons and was back on a Grand Prix podium with third place in the 1984 500cc South African Grand Prix. In 2010, Ian Hutchinson made history at the Isle of Man TT races when he became the first, and only, rider to win five races in a week. He was in imperious form all season, winning at all of the International road races, but his season – and almost his career – came to an abrupt end at Silverstone in September when he crashed and was subsequently run over in a British Supersport Championship race. With compound fractures to his tibia and fibula in his left leg, it looked like he would have to have the leg amputated, but with 16 operations and skin grafts, the leg was saved. However, complications ruled him out of 2011 and although he returned in 2012, he was far from fit. After somehow racing in that year’s TT, he withdrew from racing to start an 18-month-long recovery with a view to returning in 2014. At the last minute, Hutchinson and his Milwaukee Yamaha team entered the Macau Grand Prix in November 2013 and it was a simply stunning return. After claiming pole position, the Bingley Bullet went on to take a sensational victory from Michael Rutter to complete one of the most successful comebacks racing fans have seen in recent history. It didn’t end there either as in 2015 he took a hat-trick of victories at the TT, a feat he repeated in 2016. Another brace was taken in 2017 to move him on to a total of 16, the third highest of all time by a solo rider but a crash in the closing Senior race left him with more breaks to the same leg and he’s currently recuperating once more with a view to returning in 2018. His determination knows no bounds. 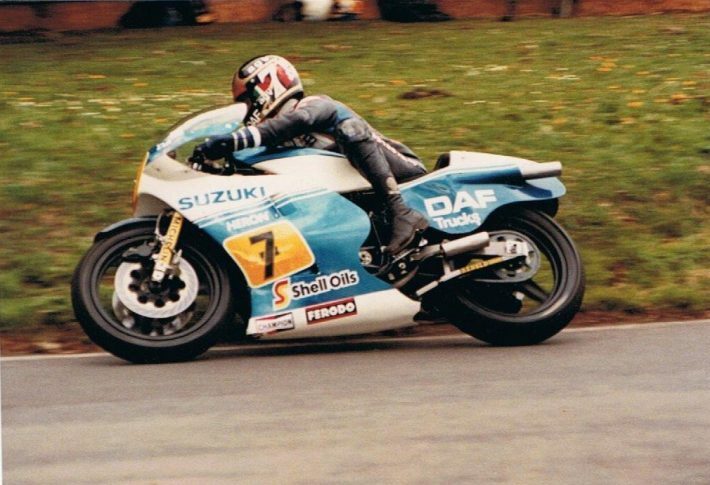 In the early 1990s, Robert Dunlop was at the peak of his powers and, arguably, the most versatile rider of the time, winning the 125cc British Championship whilst also taking the 588cc Norton to victory in NW200 and Ulster GP Superbike races. In 1994, he became the first rider to win a race on the new RC45 Honda when he took a double victory at the North West 200, a meeting where his hat-trick was completed with another win in the 125cc race. 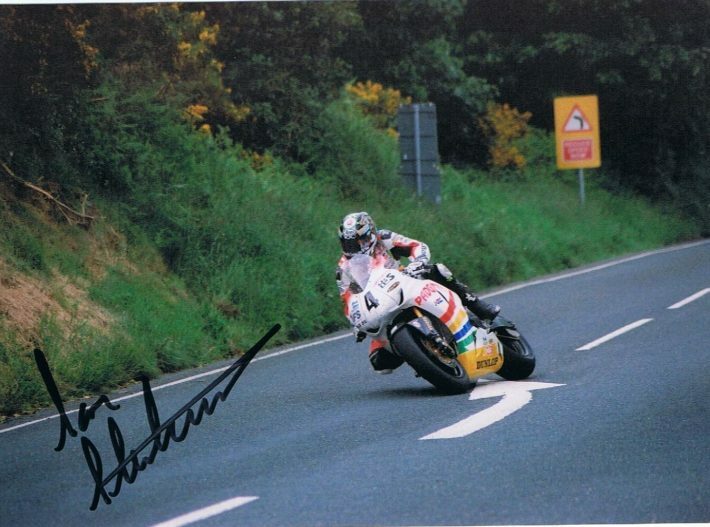 However, just a few weeks later, the Ulsterman suffered a major accident during the Isle of Man Formula One TT race, when the back wheel of his RC45 collapsed as he exited Ballaugh village. 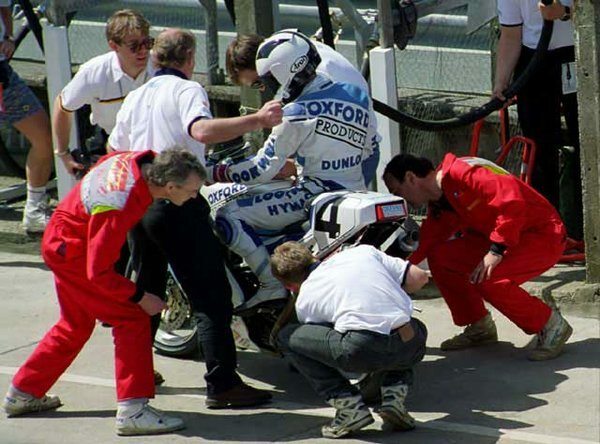 Dunlop suffered multiple injuries and a long stay in hospital, followed by protracted recuperation, meant he was out of action for the remainder of 1994 and all of 1995. He was left with severe tendon damage in his arm which restricted movement and a shortened leg but he returned in 1996 albeit accepting he could only ride in the 125cc category. In 1997, he took third at the TT and then, the following year, scored a famous victory in the same race, his fifth TT win, despite being on crutches again after a crash at the NW200 just weeks before. Despite being in continual pain and deteriorating condition of his leg, Dunlop continued to race before sitting out the 2005 season to finally have his leg broken and lengthened. 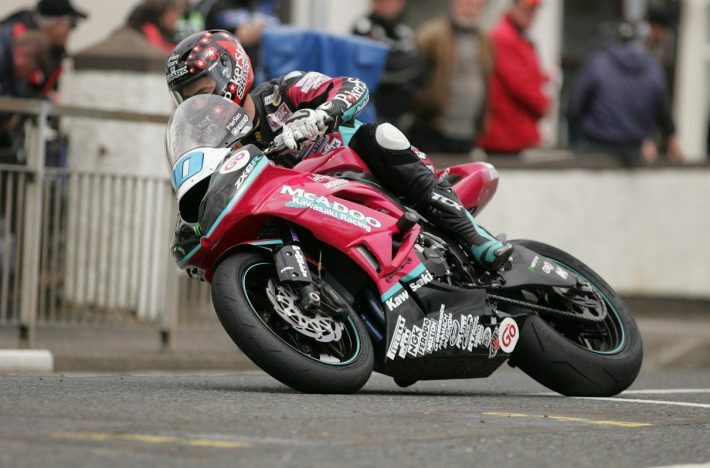 Again he returned and, with a long-term desire to win at the North West 200 once more, he took a record-breaking 15th win in 2006 with another victory in the 125cc race. Sadly, he lost his life at the same meeting in 2008. In 2010, Manxman Conor Cummins led the Isle of Man TT Superbike race after lapping at over 131mph from a standing start, just a fraction outside the outright lap record. With a lead of over 20 seconds he was well on course for his debut TT win but the McAdoo Kawasaki refused to fire after his second pit stop and, with his lead slashed, he reluctantly had to retire on the fifth lap at Laurel Bank. Later in the week, the Senior race was stopped on lap three after a crash at Ballagarey involving Guy Martin. On the restart, the Ramsey rider was only three seconds adrift of race leader Ian Hutchinson when he crashed spectacularly at the Verandah on the second lap, all in front of the TV cameras, and his list of injuries were long – a badly broken left arm (with nerve damage), two bone fractures in his back, a dislocated knee and ligament damage, bruising to his lungs and a hairline fracture to his pelvis. The recovery period was long and included two ten inch steel rods being inserted in his back but, miraculously, he was back on the grid at the beginning of the 2011 season and, despite still being far from fully fit, he took sixth in the second Supersport TT race. As time progressed, he got stronger and stronger and was back on the TT podium in 2014 when riding for the factory Honda team. He’s still very much at the forefront of the road racing results. Having won the 250cc World Championship in 1990, John Kocinski moved into the 500cc series the following year as part of the all-conquering Marlboro Yamaha team and although he wasn’t quite as successful, he did finish third overall in 1992 and 1994, the latter with Cagiva whom he’d joined halfway through the 1993 season. However, the Italian manufacturer pulled out of racing at the end of 1994 and Kocinski retired to concentrate on becoming a professional water skier. At the beginning of 1996 though, he was tempted out of retirement by Ducati who signed him as a replacement for Carl Fogarty in the World Superbike Championship. The American came close to winning the title in his first attempt, despite falling out with Ducati during the year, and with five wins finished third overall. He then joined the factory Castrol Honda team for 1997 and his comeback was complete as he won the title with nine wins and seven podium finishes, defeating Fogarty who ironically had replaced him at Ducati. Max Biaggi competed in the Grand Prix motorcycle world championship from 1992 until 2005, winning four successive 250cc world championships between 1994 and 1997 and finishing second in the 500cc/MotoGP class on no less than three occasions, 1998, 2001 and 2002. However, he lost his ride for the 2006 season and although he tried to secure a deal with Honda, Kawasaki and Suzuki, his efforts proved futile and in January 2006, he announced that he wouldn’t be taking part in the 2006 MotoGP season. An attempt to move into the World Superbike series also failed and, as a result, he took a sabbatical from racing. In September 2006 though, it was announced he would be riding for Alstara Corona Suzuki in WSB in 2007 and, despite a year away from racing, he won first time out at Qatar to become the only rider ever to win his first Superbike race and his first race in 500cc Grand Prix. He ended the year in third overall but went on to win the title in 2010, becoming Aprilia’s and Italy’s first Superbike World Champion, and again in 2012 before retiring at the age of 41. Four-time 500cc World Champion Eddie Lawson shocked the paddock when he left Marlboro Yamaha to join Cagiva in 1991 and, given the fact the Italian manufacturer had only scored one podium in over ten years of Grand Prix competition, many thought it was simply a move by the Californian to secure a big pay day before retiring. However, from being also-rans, Lawson turned the Cagiva into a front runner and after a brace of podiums in 1991 his best moment came at the 1992 Hungarian Grand Prix when a shrewd tyre choice paid dividends. The race started in the wet but Lawson opted to use an intermediate front and a cut slick rear although his decision looked to have been the wrong one as he fell backwards through the pack, at one stage over a minute adrift of the race leader. The conditions began to change though and as the track dried, Lawson’s tyres came into their own and he started to climb up the leaderboard. He sliced past those in front of him and after passing Kevin Schwantz he quickly overhauled Wayne Rainey and Randy Mamola to leave just Doug Chandler ahead. Many riders pitted to change tyres but Lawson overtook Chandler with 2 laps to go eventually winning by over 14 seconds. It was Cagiva’s first 500cc win and Lawson’s 31st and last in a glittering career. The 2000 250cc World Championship was a year-long battle between Olivier Jacque and Chesterfield Tech 3 team-mate Shinya Nakano that went right down to the final lap of the final race but even more remarkable was Ralf Waldmann’s last lap victory in that year’s British GP. The race started dry but with rain not too far away, tyre choice was a gamble. With only 13 laps to go, Waldmann’s choice of full wets looked disastrous as he was 90 seconds behind race leader Jacque and just one corner away from being lapped but then he was thrown a lifeline; it began to rain. Suddenly lapping over five seconds a lap quicker than his French rival, Waldmann closed in but as they headed into their final lap, the deficit was still eight seconds and surely too big a gap to bridge. However, Waldmann was getting quicker all the time although Jacque still led into the final corner. Ralf wasn’t to be denied though and with superior grip he accelerated past on the run to the line to take his 20th, and final, GP win and leave Jacque almost speechless.